Votey – The best preparation for tomorrow is doing your best today "H. jackson brown jr"
The best preparation for tomorrow is doing your best today "H. jackson brown jr"
First of all, let’s me define you what is an ecotourism. Basically, ecotourism is from two words which are ecological and tourism, it is the travel to natural area, as well as local communities that conserve the environment, or sustain the well being of the local people. Our main goal for this exploration is to create an ecotourism site on a Kuy indigenous community. I hope this project will actually happen one day, because it give such huge impacts on the community. It creates job for local people, by being a tour guide, giving accommodation or homestay to people, ability to show their skills or other. Therefore, it give the advantages to the natural resources, and environment as well. Before, most the villagers in the community are cutting down trees to sell or make coal, hunting for animals… But if the project happen, all of those activities will not going to happen again. In the process of creating this site, we need to do the research of the marketing for the project. We went to different places around Phnom Penh to interview the tourist from different countries. 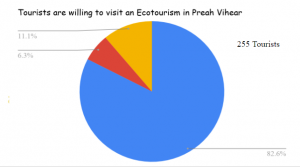 Basically, our main goal for the tourist survey questions is to ask, If there’s an ecotourism site that supports indigenous community and wildlife on the loop to Angkor Wat temple, Preah temple, and Sambor Prei Kuk temple, would they like to visit or willing to go? Good news is that 82.6% of the tourists are interested to go, 11.1% of the tourists are maybe to go, and only 6.3% are not interested to go. In addition, We went to their community and interviewed each family. Before we do our interview, we did a presentation to the villagers about what is ecotourism, the advantages of having the site and give some examples of the ecotourism place. Our main purpose is to know if they want us to create an ecotourism site in their community. According to the interview, 96.4% agrees and 3.6% disagrees. In the 4th round of Multimedia/technology, we continued our lesson which related to Python Programming. By this time, I’ve an idea of what exactly the basic of python is, as well as having a lot of new experiences related to the concept. In addition, this round we discovered some new Python areas such as functions, lists, and dictionaries. Throughout the learning of programming, challenges are always there, however it attached with positive solutions that I’ve put all of my effort into. One of an example of projects that I’ve worked in this class is called Where is the Space Station? 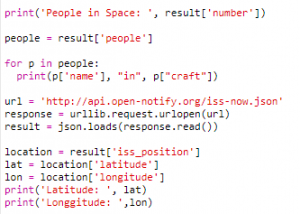 Basically, in this project we use a web service to find out the current location of the International Space Station and plot in its location on the map. This project was really fascinating for me. However, there are some challenge I’ve met which took a period of time for me to solve. The challenge wants us to add the script so that is also prints out the craft that the astronauts is in with their name. At that time, My mind was trying to think of the best solution as I can. 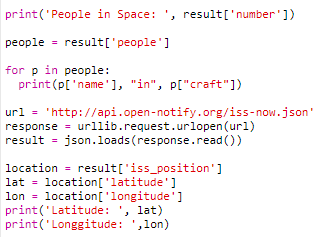 My first strategy on this challenge was just to add a string, which say (“In ISS”). But later on, I don’t think it is the best or the right answer at all. So, by this time, I went to the instruction page again and try to read and read those instruction again and again. Then, I’ve come up with a new idea so I quickly went to the code club to change it and let see if it works. My idea was to called up the value of craft. And it worked, I was really amazed at that time. What I learned from this project is about reading instruction again and again and make sure that I understand clearly on that area before I move on. Carbon ! !, Did you know that all living things contain carbon? It’s including you. Human contains 18% percent of carbon. 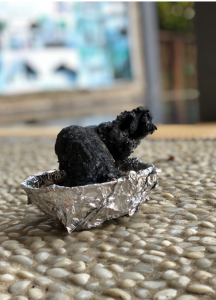 Carbon is a nonmetallic element in the periodic table with the symbol of C. It has the atomic number of 6, which means it has 6 electrons and 4 valence electron. Valence electrons are the outer energy level of an atom. Carbon Cycle is the cycle of carbon between different living organism on earth and atmosphere, though some processes like photosynthesis, respiration, combustion, and decomposition. During photosynthesis, plants use the sunlight to produce its own food. In Respiration, they are doing the process the releasing gas to the atmosphere. In addition, Combustion is the process of burning fossil fuel. Meanwhile, decomposition is when the dead organisms are broken down by bacteria and fungi. Ingredients: Baking soda, Sugar, alcohol, sand. Bowl and fire the matches and throw into the bowl. Then, the result was that we could see the small black ash in that plate. I think, during this process the carbon ash flote up because of the carbon dioxide trying to get out through the ash. It might cause some kind of reactions between sugar, sodium bicarbonate, and alcohol that create heat. According to the formula of these ingredients, one of them might lead to makes carbon dioxide gas which I think sodium bicarbonate has the highest chance (NaHCo3). And the pressure of the carbon dioxide gas pushes and create the black snakes. We’ve used a really wonderful website which is codeacademy.com in this class. Throughout the website, we can learn a different language and there’re exercises for us includes some basic lessons, too. Codeboard.io is also one of the websites which we use for running our code assignments and homework assignments. # Exercise 1: Using the while loop to print the square of all number from 0 to 5. Example 2: Using a WHILE LOOP, print all even numbers between 0 and 50. This round the main theme in Literacy class is The Search of Identity. In this theme, we mostly talking about the factor that helps us define who we are, the characters in the novels etc. We’ve also discovered a lot of lesson in Literacy such as metaphor, simile, denotation, connotation, writing poem, story element including discussion. We also read a novel in the group. The title of the book is Wonder. In my opinion, Wonder is one of the best books I’ve read before. The authors have a wonderful style of writing her books to get the readers to visualize her writing clearly. On the other hand, it makes the readers including me easy to understand. Characters in Wonder = August, his mom, his dad, Via, Summer, Jackwill, Julian and more. The jot dots of the most important information from page 1- 65. First – August has 27 surgeries and he homeschools by his mom. Second – later on, his parents want to let him to school because they wanted him to learn to deal with things. Next, he didn’t want to go to school because he is different from others. Finally, he still goes to school and people around him seem not to like him much. One of the other interesting assignments in my class is reading skills. This assignment requires to do once a day or totally in one week. It is an assignment that includes all the skills related to reading that we should have and learn for our future. It includes read and answering questions, inference, fact and opinion, cause and effect, identifying, compare and contrast, etc. Basically, this is our third round of the year. In Math class, we’ve started our Primary Mathematics 5B both in Textbook and Workbook. In addition, this round we were mainly focusing on decimal. We’ve also learned different courses such as add, subtract, multiply and divide decimals. On the other hand, we discovered multiple shortcut ways and rules to solve our problems easily. Small activities, teamwork, discussions have been introduced to us during learning decimal. Traveling Theather!! !, definitely, the theater that can travel from place to place. 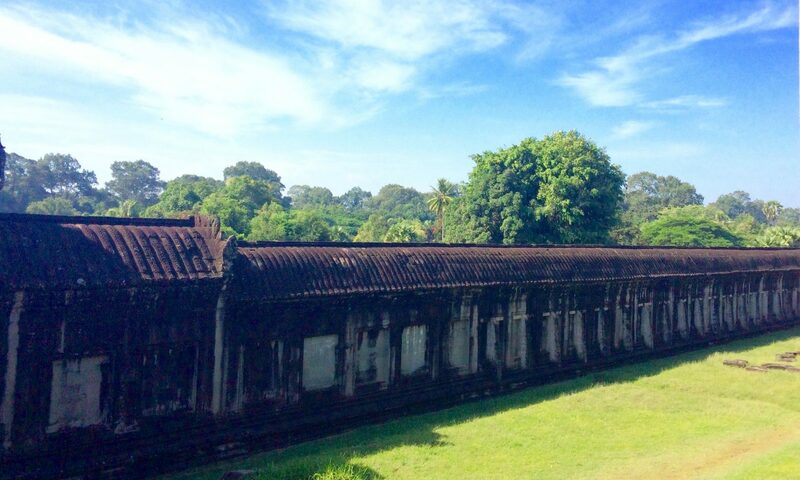 It sounds unusual but our exploration and project made it happened once we’ve traveled to some places around Cambodia. Our main goal in this exploration is to showcase performances, educational films, plays like theatre to the rural communities and rural schools in the provinces by providing people with opportunities to watch performances and getting awareness while having entertainment. In this exploration, before we go on trip, we’ve prepared a lot of stuff. We’ve studied about the setting up our stage in different situations depending on the place we are going. Especially, I am one of the communication crew which I need to contact people in orders to get their place to perform. It was kind of a challenge for us all because we need to contact from one person to one person to get the phone number that we want to have. In addition, we need to write the letters to request them also. In this trip, we ‘ve been to three places in two provinces. We went to two schools in Takeo and Kampot and a community in Takeo. As our first trip to an elementary school in Takeo, it was a bit challenging for us to perform because the students are too young as our target audiences and they were not really paying attention to us all while performing. Our second place is at the parking lot near the market in a big community. The challenge for us in this place is finding the exact spot to perform. Consequently, this second trip is a successful one. Our third place is a really really wonderful one because the students at the school were enjoying our shows and having fun. This exploration and trip is a really enthusiastic experience for me while I’ve learned a lot of concepts. The theme of this round is about social and environmental injustice which mainly talking about how can pollution related to inequality and how can it affect us as citizen. Our final assessment of this round is an argumentative essay of a topic. In this concept, we did some process such as brainstorming, pre-writing, write a rough draft, peer-review, revise idea, edit and the last is publish. In order to have a strong argumentative essay, we need to learn how to write a strong thesis statement, choosing evidences. All the references identify as primary source or secondary source. Primary source is the first-hand source which takes action in the real event, for example, photographs, autobiography, maps, diary, documented. Secondary source is the second-hand source which from the primary source such as textbooks, articles, etc. This is my wonderful argumentative essay. Please enjoy reading! Millions and millions of fish have been caught, annually. There is a problem before those fish hit your plate because right now we simply cannot tell if the fish we eat were illegally caught or not. Which means, illegally caught fish are getting into the seafood market at different points of their journey from bait to plate. The IUU stands for Illegal, Unreported and Unregulated fishing. This is a global issue around the world. Illegal fishing is the action of fishing that not allowed by law. Some parts of the world, people used huge nets or electric shock. These actions occur in parts of the ocean where fishing is not permitted or fishing greater numbers than a fisher’s permit allows to catch. Even though illegal fishing makes people a lot of money, we should abolish those actions. Illegal fishing negatively affects marine environment/ecosystem, economics, and species extinction. Illegal fishing is extremely harmful to the marine environment and ecosystem. These methods would strongly affect marine species in the ocean. If there are many fish have been catching, it is an adverse effect on marine biodiversity. Every single aquatic plant and animal has a role to play for balancing themselves with their environment and surroundings. So in order to thrive, marine creatures require some kind of environment and nutrients, which in this process they may depend on other organisms. For instance, some of the people tried to improve the method of catching Tuna. Tuna is a part which is very essential to the ecosystem because it is a huge part of millions of marine species diets. Having less amount of Tuna, a very special species, can cause really serious threats to sharks, seabirds and sea turtle (World Wildlife Fund). In addition, it destroys the marine habitats including coral reefs or sea turtle nesting beaches. It makes the marine animals have no habitat to live anymore, which take more time for them to build a new one. According to Marine Science Today, seabirds such as puffins were depended on the sand eel for their food around the Shetland Islands. Especially, with the loss of sand eels, seabirds around Shetland Island might be declined (Krysten). As mentioned, in the ecosystem organisms depend on each other to thrive, which means that if the food chain breaks at any level, it will affect all other living organisms in the ecosystem as well. To sum up, Depletion of fish populations and destroy the entire marine food chain also the main part of Illegal fishing. Economics is also related to Illegal fishing. It leads to some of the detrimental effects to the economics which especially to the local fishermen and local communities. Advantages and benefits are being provided from marine species, including ecosystem services such as the distribution of food, medicines, and livelihood. They also support tourism by entertainment activities around the world (IUCN). Fishermen who use the legal fishing gear could lose their fishing opportunity and lose the value of the catches. They may lose income for their family expenditures which working in the fishing industry. Nearly all of the legal fishermen are living near the ocean which they live partly depends on the fishing field to spend everyday expenditures for buying food and stuff. For instance, Orbital Admin, a writer in stop illegal fishing.com, was saying, “The Marine Resource Assessment Group estimate that Africa loses $1billion a year to illegal fishing, and since fishing is the basis for 45 million livelihoods in sub_saharan Africa” (Admin). This means it affects a large number of family who makes a living depend on the ocean. Illegal fishing may cause having less fish in the ocean, which also makes other fishermen couldn’t find much fish for their income. The Illegal fish harvest may be brought to market at a lower price because there is a lot amount of fish. This is unfair because fisherman that are fishing legally are losing income while the illegal fisherman is making more profit since they are bringing in more fish. It’s kind of unfair of prices to the same product that is from legal fishing. However, the low prices of fish won’t take the short amount of time to increase. Hello! welcome to my blog! 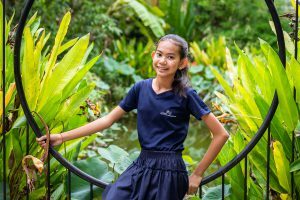 My name is Votey (SaraVotey Mom), a student from Liger Leadership academy, which is located in the capital city of Cambodia, Phnom Penh..I am thirteen years old and I am from Kandal province, Cambodia. Learning at Liger is a great opportunity for me because that change my life and my country. I am going to be a change agent in my country. I am a very determined and motivated person. However, my interest are in math, literacy, science and robot. I have joined a few robotic competitions which the theme were also relative to science. The other things I like to do is networking and meeting different people and we can know about their story and experiences. My goal is have good grades, attend abroad university, have good careers and change my country and the world. If you want to know more, please read more about me. Thank you!